After ten-day’s Microsoft SharePoint Conference 2011 journey, life here at BoostSolutions comes back to normal. For me, SharePoint Conference is a prominent and eye-opening event. We have met some very cool people who were interested either in our products or our partner program. Furthermore, some of our customers also dropped by our booth and gave us very positive feedback and suggestions. We are very grateful to them all. 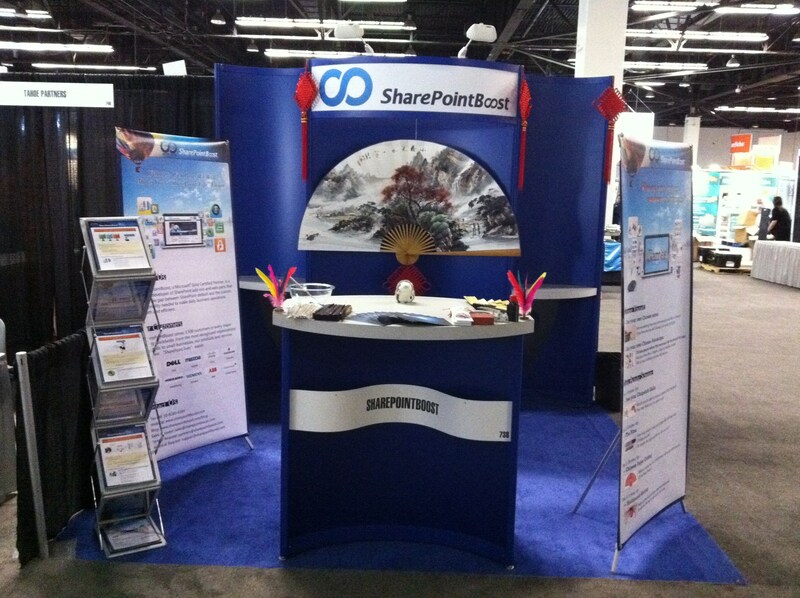 Thank you for visiting us at SharePoint Conference 2011 at Anaheim, California. And I hope you enjoyed the show as we did! For us at BoostSolutions, SharePoint Conference 2011 represented a unique opportunity to talk with our customers face to face, learn from SharePoint experts and project a true image of who we are. As such, we have put lot of thoughts and efforts into this once-a-year event. In addition to endure jet lag and a more than 16-hour flight, we also prepared a lot of product flyers, demos and free gifts. Proudly, I can say the results we have obtained were far better than our expectations. That being said, everything has its positive and negative points. This gathering has brought us a lot of positive elements and alas some regrets. In the following parts, I am going to detail those gains and losses, so that in the future we can do a better job. 1. Our customers are very happy with our products. They are eager to test out our new products as well as spread the words to other people. The most heard comments from our customers were “I am your customer, we are using *** and it is working great. Do you guys have any new products recently?”. For me, this kind of word is as sweet as from lover’s mouth. In addition to these sweet words, we had a few surprises. 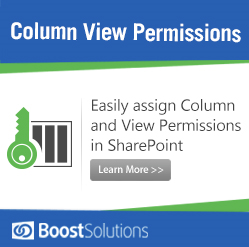 A consultant from one of the top consulting firms introduced our SharePoint Column View Permission to more than four of his friends and colleagues in two days. I cannot say enough how grateful we are to our customers and booth visitors. Their support are our constant drive to build greater web parts and add-ons. 2. 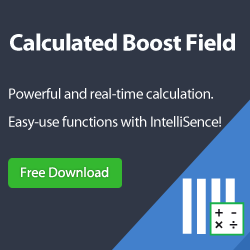 Our support has improved dramatically since we beefed up our support team and expanded our support time. Our new support time is: 9:00-13:00 (EST),10:00-14:00 (EST+1, EDT) New York time; 08:00-11:00 (GMT), 08:00-12:00 (GMT+1, BST), 14:00-18:00 (GMT), 15:00-19:00 (GMT+1, BST) London time; and 07:00-12:00 (AEST), 08:00-13:00 (AEST+1, AEDT), 14:30-21:00 (AEST), 15:30-21:00 (AEST+1, AEDT) Sydney time from Monday to Friday. Moreover, online live chat has also improved our response to customers’ questions. Since last year, we initiated a project in order to kick our support quality to new level. This on-going initiative has created some tangible results reflected during the SharePoint Conference. Even though we value our support as much as our products, there is a long way to go. We have received quite a lot of suggestions from our customers, and we are determined to improve support as much as we can. 3. SharePoint has captured significant market share since its debut, which proves right our decision to stick to SharePoint. 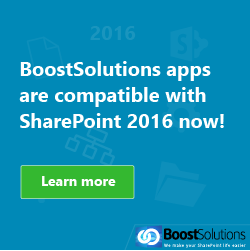 From the day one, BoostSolutions has dedicated itself to SharePoint, because we believe SharePoint is a very successful product and has a huge potential. Just because of our dedication, we have created some of the best web parts. 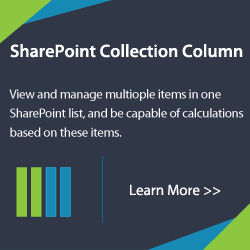 Our SharePoint Column View Permission and Calendar Rollup web parts are results of our dedication to SharePoint as well as our deep understanding of it. In the future, we will grow with SharePoint by providing unparalleled web parts and services to SharePoint users. 4. We have a lot of very good web parts and add-ons which are of great value to our customers. We have won couple of coveted awards with of our products, but SharePoint Conference 2011 further confirmed that our products arewidely popular among SharePoint users, experts and media alike. People from Gartner made a special trip to see us and asked some interesting questions. It is a surprise that we emerged in such famous company’s radar. 5. Our booth and materials were very popular and useful. The design of the booth and the posters fairly presented BoostSolutions – young, energetic and solely focused on Microsoft SharePoint. 1. We should have ratcheted up our marketing strengths. It is a shame that so many visitors are so excited about our products but they had not seen our products before. We had sent out our SharePoint Column View Permission flyers right after two days. Put in another way, more than two hundred flyers were taken by our booth visitors in just less than two days. We had to print another two hundred black and white flyers. Although proud of this kind of “incident”, we also feel regret not to have done enough to present such a great product to our potential customers. 2. We should have attended more SharePoint events, be it online or with physical attendance. A SharePoint conference is a great yet rare opportunity for us to present our products to our fellow SharePoint developers. There are a lot of SharePoint activities around the world focusing on different topics, participating to these events is a very good way to show who we are and, most importantly, what our products can do. As a dedicated SharePoint web part provider, we can definitely bring something important to the table. 3. Our partner program could be more aggressive. During the conference, we have encountered numerous potential partners who are very interested in us because of our great products. With these products under our belt, we can build up a very wide partners network to give our customers more superb services. 4. We are providing quite useful services and some of our products offer some features that our customers do not know of. We have upgraded our web parts and add-ons to support both SharePoint 2007 and 2010 long time ago, but we have been asked if our products worked with SharePoint 2010 or 2007. Again, we have a big mountain to climb in terms of spreading our value to our customers and SharePoint users. All in all, we had lots of fun in the United States and in SharePoint Conference. Our 8-day stay in such a beautiful place like Anaheim is a fabulous experience. SharePoint Conference was also very well organized. Thank you Microsoft, sponsors and, most of all, all our visitors who have visited our booth. See you guys at the next conference in Las Vegas on November 12-15, 2012. I am sure we will present more cool web parts and add-ons.